Jerry L. Rogers, a 34-year alumnus of the National Park Service (NPS), served for a decade and a half as the Service’s senior officer for every NPS historic preservation and cultural resource management program – both inside the parks and nationwide. He presided over a period of unprecedented growth and maturation in these programs – serving the administrations of three presidents. Today, many of the Service’s and our nation’s heritage programs bear his mark and influence. A passionate student of the Great American West – its history, its people, and its landscapes, Rogers was born in 1938 and grew up on the Llano Estacado of West Texas – the son of Ancell Robert and Grace Evalena (Coin) Rogers. Jerry received bachelor’s and master’s degrees from Texas Tech in 1963 and 1965 respectively. Jerry joined NPS in 1965 as a seasonal historian at Fort Davis National Historic Site in West Texas. He then transferred to Washington, DC headquarters to participate in the development and launch of the nascent programs of the recently-enacted National Historic Preservation Act serving first as a staff historian with the new National Register of Historic Places. Rogers later served as the third Keeper of the National Register for more than a decade. 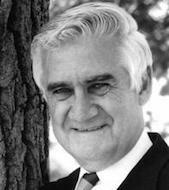 As the Service’s heritage programs grew so did Rogers’ influence until he was appointed the Service’s Associate Director, Cultural Resources, presiding over park and national programs – a position in which he served from 1983 until 1994. Jerry has been called “an energizer for historic preservation.” He was as influential as any public official in launching and building many of our nation’s most widely-known and respected federal heritage programs – garnering political support on the Hill and with Presidential Administrations. Programs that thrived under his direction include: NPS Museum Services, Vanishing Treasures, Native American Graves Protection and Repatriation Act, Ethnography, American Battlefield Protection Program, Tribal Cultural Preservation, Cultural Landscape Program, on-job skills development, and a system of harvesting technical information from program experience and directing it back into the program. During this period Rogers represented the Secretary of the Interior as Trustee of the National Trust for Historic Preservation. He traveled to Italy, Russia, Spain, China, India, and Egypt on behalf of the National Park Service. In 1994, Rogers returned to his beloved West serving briefly as Southwest Regional Director in Santa Fe, as Superintendent of the Southwest System Support Office, and as Chair of Discovery 2000 – the NPS General Conference in St. Louis – retiring in 2001. Rogers’ retirement has been anything but. He served as a member of the Executive Council of the Coalition of NPS Retirees (now The Coalition to Protect America’s National Parks), for the National Parks and Conservation Association as Chair, Cultural Resources and Historic Preservation Committee of the Second Century Commission, President and Board member of the New Mexico Heritage Preservation Alliance, and is a volunteer Site Steward for The Archaeological Conservancy. He has been an effective advocate for the protection of the 89,000 acre Valles Caldera National Preserve in New Mexico which was recently transferred to NPS. He is an articulate voice for the preservation of desert night sky and now is working to ensure the long term protection and appreciation of the 1939, Civilian Conservation Corps, Old Santa Fe Trail Building in Santa Fe. Jerry and his wife and partner Nancy Burgas live south of Santa Fe in the high desert of New Mexico.